The market is overpriced. So if you are a real estate agent trying to communicate with sellers, how do you get someone who wants to test the market at $500K to realize a more reasonable price is $375K? There are surely many strategies, but today I want to mention the power of graphing neighborhood sales. I don’t mean to beat the dead horse by bringing this up again, but knowing how to graph will help you communicate effectively, stand out from other industry professionals, and seize your role as a market trend expert instead of letting Zillow have all the glory. Sure, you can show your client a graph of city or zip code trends by using Trendvision, but it’s hard to argue with neighborhood-specific data. A letterhead to give your sellers: Before we dig in, here is a letter I wrote for sellers about things to consider when pricing in this market. This letterhead is based on a post I wrote recently, but I tweaked a few things. See the image below and DOWNLOAD here (PDF). Feel free to email or use as you see fit. Obviously the letter does not address a specific property. If you need a letterhead for your specific property, let’s talk about some consulting. Excel Tutorial: I know, you don’t use Excel because it’s only for nerds. But let me break it down for you below so you can join the club. Previously I shared a tutorial on how to graph with Gnumeric, but I had a few requests for using Excel instead since that’s what most people already have on their computers. This graph shows the range of similar-sized neighborhood sales is between $300-375K for the most part (instead of $500K). This can be a very powerful visual, especially when you begin to show the sales at $375K have been remodeled. A tutorial on how to show the market: I recommend watching the tutorial below and then pulling up some MLS data for a neighborhood you are working in so you can create a graph by following the steps I took. This is perfect for Sacramento MLS, but as long as you can export data from your MLS system, you should be okay too. You may need to pause my video several times or rewind at moments. Whenever we do something new, it takes a while to catch on. If you don’t have Microsoft Paint to paste the graph like I did, you can use a different photo editing program, or maybe use a snipping tool on your computer. Additionally, you can open up Paint and simply start a new file, and then paste your graph (as opposed to opening an existing photo like I did). Watch below (or here if it’s too small below). Please let me know if you have any questions. I hope this was helpful. Perhaps this will spur on a new skill set for you that can make a difference in your business. Questions: Was the tutorial helpful? Anything you need clarity on? Can you teach an old dog new tricks? That’s questionable. It’s certainly not easy for us humans to learn new things either. But let’s talk about one skill in real estate that is HIGHLY attainable, yet something that most will ignore (which can be good for you). Knowing how to graph neighborhood sales sounds really dull, but it’s truly something that can be an amazing tool to help you stand out from the crowd and look like a rock star to your clients. We live in a visual world, so graphs help clients see the market. Neighborhood data can be far more powerful than zip code data. Why let Zillow or Trulia make all the graphs? Show your skills. Graphing helps you understand trends first before talking with clients. Graphs are perfect for sharing on your blog or social media. A tutorial on how to make trend graphs: I made a tutorial below for you to check out. I recommend watching it and then pulling up your MLS so you can create a graph by following the steps I took. This is good for Sacramento MLS, but it’s also good for any MLS so long as you can export data (which is probably only a matter of clicking one button). Ask your MLS how you can export data to a spreadsheet if you cannot figure it out. I use Gnumeric in the video (a free version of Excel), and you can download that here for free. Or just use Excel, which is similar and what I use all the time for my fancier graphs. You can watch the video above or directly here on YouTube. If it’s too small here, watch on YouTube for a larger version. Does this image help illustrate the market? What story does it tell? Should this seller in Rancho Cordova list at $230,000? Some Quick Advice: The only way to add skills in business is to take a stab at learning something new, but one big reason why that doesn’t happen is because it can feel intimidating to take that first step. When it comes to graphing it’s easy to think it is only for techies, but trust me, you can do it. The more you practice, the better you’ll get. Remember, you are going to impress your clients by showing them the market visually. Don’t just tell them. Show them. I recommend trying out a graph every time you need to comp a neighborhood or maybe whenever you get a new listing. There are so many different types of graphs too. You can look at my market trends category for some examples. Whatever you do, get into a rhythm so you are practicing regularly. If you have some questions too, don’t hesitate to ask. Is it a condominium or townhouse? What does the plat map say? How do you know if a property is a condominium or townhouse? There is quite a bit of confusion about this question actually, and this uncertainty translates into properties in MLS being frequently labeled as “condos” when they’re really townhouses. The distinction is of course really important because comparable sales really should be the same type of property, right? What does the plat map say? If you don’t have a preliminary title report at your fingertips, knowing how to view plat maps can actually make a huge and quick difference. 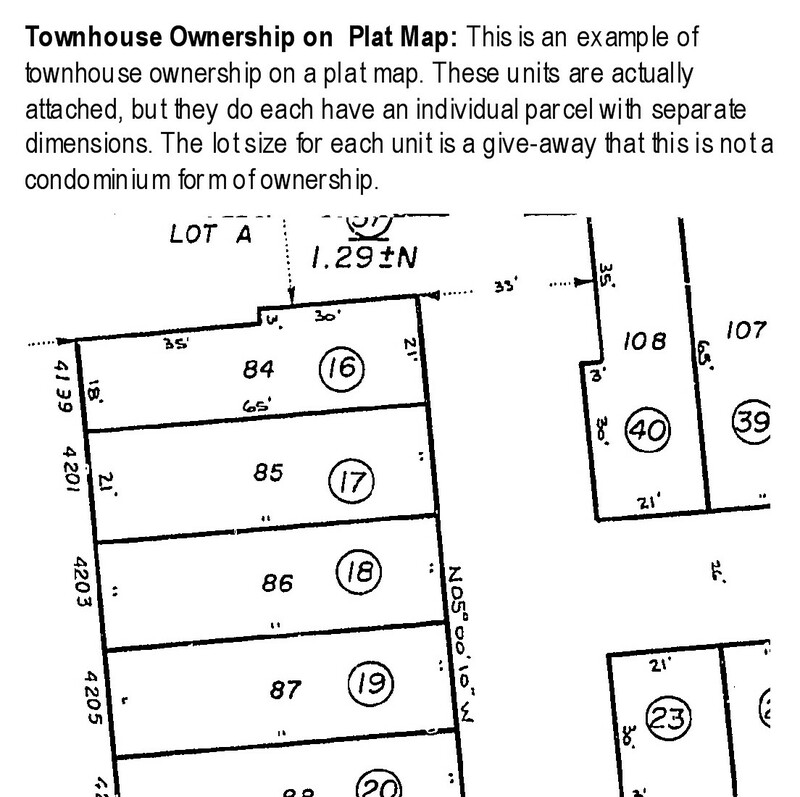 Take a few minutes to watch the screencast below (or here) where I show three examples of how looking at a plat map can help identify the type of property. I know, this ranks low on the exciting scale, but trust me, if you’re in real estate, this is really good stuff to know. The video is a bit larger if you watch directly on YouTube. If anything is unclear or you have questions, speak on. 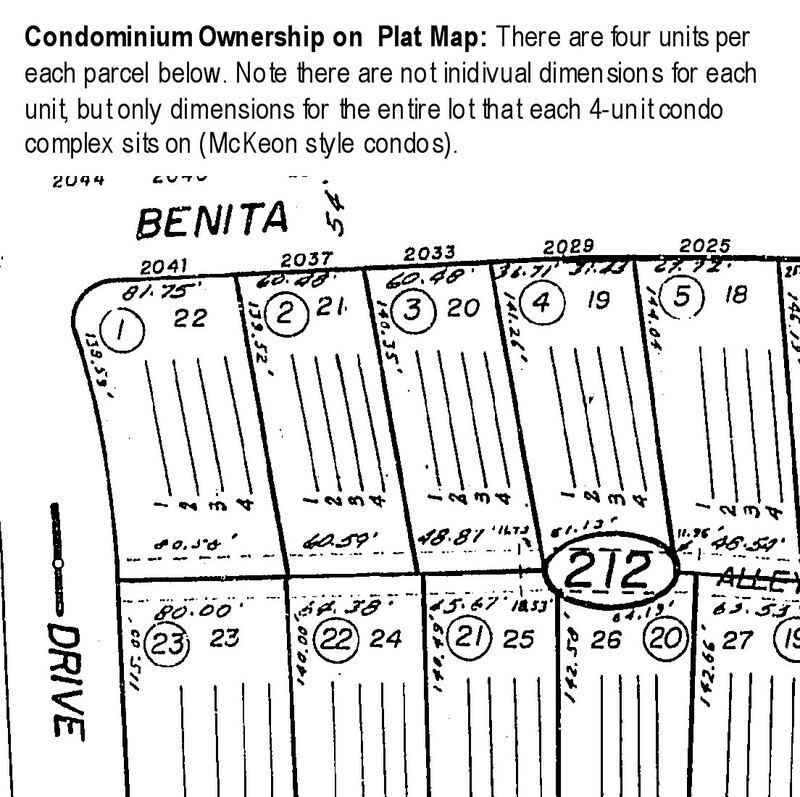 Does the plat map show specific lot dimensions for the individual unit on a parcel? If so, it’s most likely a townhouse PUD and not a condominium. This is an important indicator that’s often missed in listings on MLS. 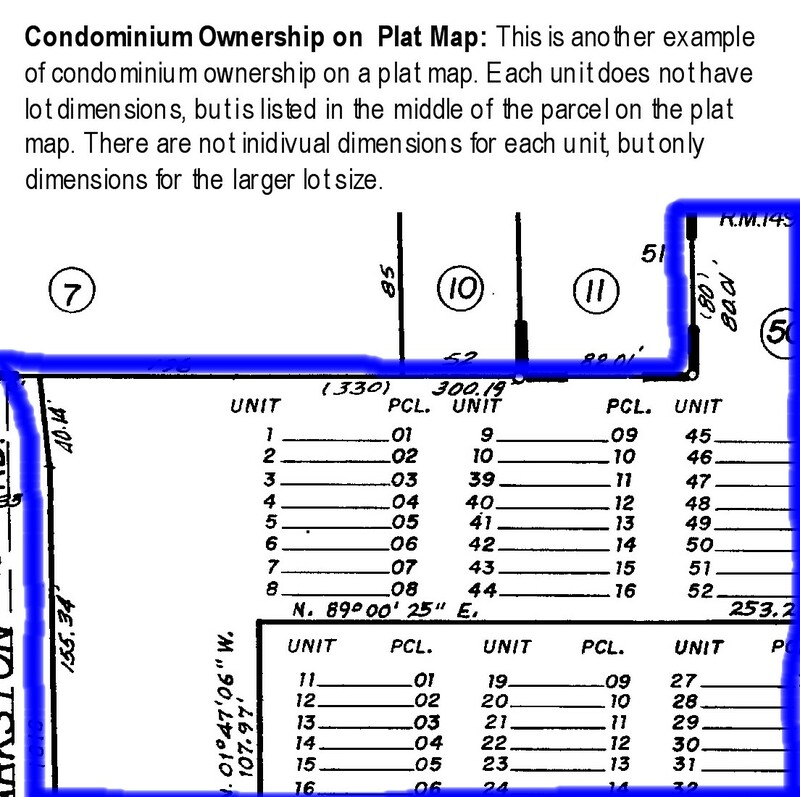 The owner of the condominium does not have ownership of the entire site on which the unit is built, so there is no reason to give specific dimensions on the plat map for the lot shape (the only dimenstions for a condo in the plat map are for the entire parcel where all units are located – NOT each individual unit). Click the thumbnails to view example images. NOTE: This information is good for the Sacramento area and may not be relevant for other areas. Do you use the Google Maps app on your smart phone? Have you seen the “street view” feature yet? This feature is of course available online, but it’s neat to see on a smart phone too. I think “street view” is a great tool to begin to see a neighborhood in more detail before physically going there. Have a look at the video below (or here) and let me know how you think street view might come in handy for you. If you have an iPhone and need to use “street view”, check out this well-written article from REbliss. The iPhone and Android app are similar, but they do have differences.